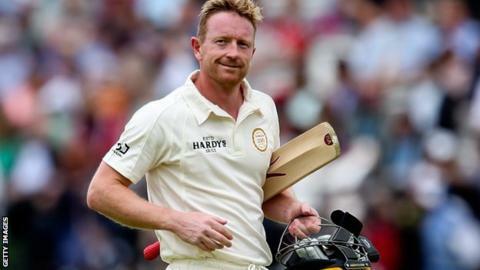 Durham skipper Paul Collingwood has put aside retirement plans and signed a contract extension until the end of the 2015 season. The 38-year-old former England all-rounder, who played 68 Tests for his country, will continue in his role as the county's captain. He has scored 13,759 first-class runs at an average of 35.92. "You're a long time retired and I've still got ambitions to take this team forward," he told the county's website. "It really is a special group of guys to be involved with and I don't want to give that up too early." The ex-England one-day captain had previously suggested he may retire at the end of this season but, with last year's County Championship winners battling to avoid relegation to Division Two, he has decided to carry on. "We've got a lot to play for in the back end of the season with the quarter-finals (of the One-Day Cup) and trying to avoid relegation, which would be a huge achievement," he said. "There is a bigger picture as well, which is about having another year to continue to create a culture that will hopefully be around for another five to ten years. I'm certain that the backbone of this side, with the youngsters coming through, will be strong for years to come."